You are here: Home / Health / Having Fun And Benefiting From Playing Jigsaw Puzzles. Having Fun And Benefiting From Playing Jigsaw Puzzles. (ThyBlackMan.com) Are you the type of individual, who absolutely loves testing your brain? Do you adore stepping back in time and experiencing nostalgia? If you answered yes to both of these questions, it is high time you got yourself a tough puzzle. These puzzles are incredibly complicated, yet surprisingly fun and will keep you entertained for an extensive period of time. 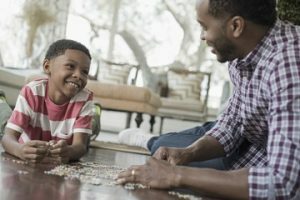 Whether you’re fifteen years old or ninety, you can have an abundance of fun, while attempting to put all of the puzzles pieces in the right spot. Of course, these puzzles can be more beneficial than you might imagine and the benefits go far beyond entertainment. Continue reading below to learn about the enormous reasons for playing with jigsaw puzzles. When it comes down to it, the main reason people sit down and try to solve puzzles is for the entertainment value. They’re incredibly fun, yet also relaxing. During your puzzle solving, you’ll be forced to put one-hundred percent of your mind towards the goal of solving the puzzle and this will encourage you to forget about your responsibilities and worries. You’ll be consumed by what is in front of you and all of your worries will disappear for a brief period of time. So, the next time you begin feeling stressed out and worries, you should reach for a puzzle. Although puzzles can be fun when solved alone, they’re even better in groups! By getting together with your friends and family members, you’ll be able to work the puzzles together. Not only will give this you the ability to develop a stronger bond with these individuals, but you’ll also develop your social skills. You might as well face it. A lot of people aren’t capable of working well with others. This is unfortunate, because teamwork and cooperation is often keys to success in the work field. With this in mind, you should know that there is no better way to develop a solid team than by solving picture puzzle together. These puzzles will require you and your teammates to work together to solve problems. You’ll be encouraged to communicate, discuss the possibilities, and find a solution together. This will help to develop a more compatible and effective team, which will be able to conquer anything thrown its way. Humans are required to solve problems each and every day. Sometimes, a problem will spring up on a whim and you’ll be forced to make a split second decision. Repetition is key for being a successful problem solver. By solving puzzles frequently, you’ll be able enhance your skills, so you’ll be more prepared for those unexpected problems, which will arise in your personal and professional life. Puzzles are the perfect tools for enhancing children’s hand and eye coordination. It is very important for children to be able to efficiently coordinate their hands, using their vision system. Children that have poor hand-eye coordination will not be able to guide, direct, or control their hands or eye movement. Children with disabilities can definitely benefit from jigsaw puzzles and luckily for parents, these come in an array of sizes. Large pieces will be more suitable for children, because they will be able to firmly grip them in their hands.